Welcome to “Reviewing While White,” an occasional series of reviews by our core contributors. Some of our reviews will seek to spotlight positive examples of books to which we wish to draw attention. In the spirit of Debbie Reese’s charge, others will criticize books which we believe perpetuate White dominance. All Reading While White core contributors stand behind the reviews published under the Reading While White byline. Reviews reflect our individual positions, not those of our employer, or other reviewing bodies or committees to which we contribute. I have not read much of, or about, Paul Laurence Dunbar. So when I received Jump Back, Paul: the Life and Poems of Paul Laurence Dunbar by Sally Derby, with illustrations by Sean Qualls, published by Candlewick Press, I dug right in. I moved ahead, marking questions about where Derby was heading with her arguments, so that I could check back at the end to see if they were resolved. But then I read, on page 10, in regards to rough treatment from Paul’s father Joshua: “It wasn’t like Joshua was heartless. I’m not excusing the beating, but life had treated Joshua rough. Raised a slave, how could he know what family life could be like?” In case you didn’t catch the microaggression: in that last sentence, whether intended consciously or not, Derby suggests that Black people born into slavery could have had no concept of family life. Sucker-punched, I read on through to the end, marking even more questions for follow up, and finding none of them answered in Derby’s text or aftermatter. So I gave myself a mini crash-course in Dunbar, reading through the sources that Derby indicates she consulted the most. I was surprised to feel I was reading about a completely different Dunbar than the one Derby presented. Dunbar was born in 1872, to parents who were formerly enslaved. Derby relates his parents’ story and his early life. “His mama, now, she liked telling about life in the slave cabins--everyday goings-on, especially the funny ones. 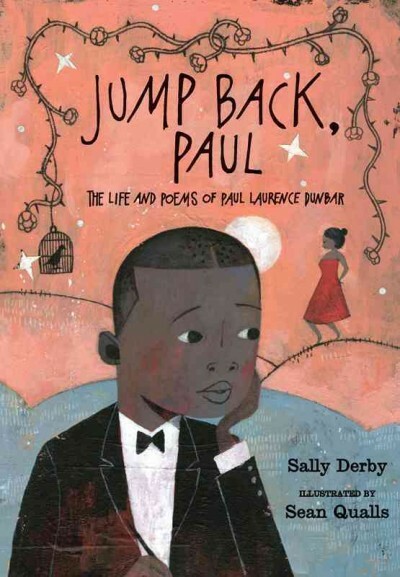 Even when Paul was grown, he liked to listen to old folks talking about their lives, and sometimes he’d turn their memories into poems.” (p.4) This becomes an opportunity to share some of Dunbar’s famous poetry in dialect. But by repeatedly interspersing these with stories of his childhood, drawing direct comparisons with the subject matter, and including suggestions such as “If you’re wondering what it was like growing up back then [during Paul’s childhood], you read Paul’s stories and poems, you’ll get a good idea,” (p.15) Derby lays a misleading suggestion that the experience of these poems came from Paul’s own childhood, rather than from stories told to him. Paul’s childhood was a generation removed from the childhoods presented in his dialect poems, and it was a crucial generation, as it spanned Emancipation. She moves on through his youth and young career to his success as a poet, and continues to include his poems both in dialect and in “formal” English. The difference in the reception of these two styles is the central argument of Dunbar’s work. His poetry in dialect (and his Broadway minstrel writing) was what made him famous in the White literary establishment, and this was a topic of debate among his peers, yet Derby only brings it up, late in the narrative, as a point of contention between Dunbar and his wife Alice (p.88-89), almost entirely avoiding it, and certainly marginalizing its prominence in his career. Why? In her author’s note, she speaks to the Grandma voice that inspired her, and talks of how she argued with this voice. “I’d say, ‘I don’t know what to write here. Some experts think one thing and some think another.’ And she’d answer impatiently, ‘Those people wrote their own books. This one’s yours. You need to write what you think.’ So that’s what I did. With Grandma’s help.” (p.104) Yet we’re never clear on what Derby thinks about Dunbar. She doesn’t offer much in explanation of his poems, as if intending for Dunbar’s work to speak for itself. In Chapter 6 she starts to get into Dunbar’s political commentary, and then excuses herself at the start of Chapter 7 “There, now, I guess I strayed away from my story a little bit, didn’t I?” (p.79). In other words, his political views are not central to understanding him, in her estimation. On page 98, Derby’s “Grandma” says, regarding Dunbar’s famous line “I know why the caged bird sings”: “You don’t have to be black to understand the longing in that poem, to feel its sadness.” (p.98). Here Derby seems to be justifying herself, acknowledging that she can appreciate and understand Dunbar even though she’s White. Does she also realize the many microaggressions that reverberate from this statement, stripping the very importance of Blackness from the appreciation of Dunbar’s poems? Did she consider what a Black child reading this line would hear? It’s as if Derby is hiding behind a fictional voice she hopes will lend credence to avoid writing about what she doesn’t want to touch. She avoids the uncomfortable questions regarding race, class, and White privilege in the literary establishment that were central to Dunbar’s story as a writer, and are not inaccessible to a young reader. We are left with what feels like a “White polite” version of Dunbar. That this was clearly thoroughly researched and painstakingly written, and that Derby clearly admires her subject, makes the whole endeavor even more frustrating to read. Thank you. What a great review of a problematic text. You caught and unpacked the nuanced microaggressions. Joining Dhonielle in saying thank you, Nina! You said you did a crash course in who Dunbar was. That crash course, I think is a key to the change we want to see. Writers mean well, but raised in a society that centers whiteness, their good intentions blind them to power structures that keeps that whiteness at the very center of society. Abstract 'we can do better' calls are good, but showing writers exactly where they went wrong gives all writers and reviewers and editors and readers tools that they can work with. That's how we learn! Thank you, again, Nina, and I look forward to more reviews that do this. Here, on Reading While White, and elsewhere. "What’s unfortunate is that the narrator’s affectation—from using variations of 'jump back,' 'honey,' and ' ’bout to' 'scoot back,' 'mama,' and 'hmph' —makes readers wonder how the author envisioned the grandmother, specifically her race. Dialect is tricky, and well-intended voice can backfire, especially for parents of black children seeking books for them. While the author is otherwise quite respectful toward this beloved black poet, as many grandmas of various races and ethnicities would say, it’s not what’s said but how it’s said." I found the Kirkus reviewer's consciousness of audience (i.e. "parents of black children") to be especially notable and encouraging. This leads me to a question: is it possible for any writer who is not Black to use Black English or dialect effectively? I am always uncomfortable when I hear non-Blacks adopting it, whether it's high school kids on a city bus or pop stars like Justin Bieber, or authors at their own readings. There's something that feels very pejorative about it. KT, I was so relieved to read that Kirkus review. It concerns me that we don't have a standard of subject-expert-critique in review nonfiction for children, as there is for adults. We get 175-200 words, and there is no expectation of critiquing the author's analysis of their work, only the literary application of their subject. I'll have to think about the dialect question. It is so hard to do. In an interview over at Lee & Low's blog, Derby talks about her appreciation of dialect. That is nice, but I just question the motivation here. Derby seems to claim poetic license, that this disembodied voice is what inspired her. It just feels, and reads, like appropriation to me. I was interested in your review, Nina, as the voice in this book made me very uncomfortable. And like you I too looked at other reviews and was relieved to see the Kirkus reviewer felt similarly. As a White person who wrote a book from the POV of an historic enslaved child from what is now Sierra Leone, I pay a lot of attention to other Whites who write from outside this way. And after reading this postI went back and read my book again, trying to ferret out micro-aggressions of my own. I think I'm too close to tell (too worried no doubt:), but I do know that even before this conversation I had no plans to write another book from that POV. This is Joshua's mother talking, right? Wouldn't the same explanation apply to her? Presumably she raised her son in slavery. Is she saying she didn't know what family life could be either? But clearly she is critiquing it so she does know. It doesn't work. I remember when Virginia Hamilton retold the story "Little Eight John" in THE PEOPLE COULD FLY. In this story a mother keeps telling her little boy not to do things that seem nonsensical, like not to count his teeth, not to sit on a chair backwards, etc. When he disobeys, Old Raw-Head-and-Bloody-Bones gets him and he turns into a grease spot on the table that his mother just wipes away with a rag. "And that was the end of Little Eight John." In her author's note, Hamilton talked about the challenges Black parents faced in slavery times. They had to teach their children to obey without asking why, arguing, or standing up to authority because it was a matter of survival. If it were a White person making a command, immediate obedience could be the difference between life and death. All this is to say, I'm not sure a Black author would have given the same explanation for Joshua's "rough treatment" of his son. As an aspiring writer, I appreciate these kind of reviews and blogs. It offers insight into how a book will be received by a critical reader. There are many aspects to the craft, and the writer's ultimate goal is to evoke a reaction in the reader. No matter how "well-intended" an author might be, the words are no longer the author's to explain when the reader picks up the book. If writers aren't aware of, or don't focus on the array of reactions to how race is written, then we fail the craft. And it won't matter if the author calls out "but that's not what I meant" after the fact. Sometimes it is better to put down the pen. That statement about Joshua's treatment of his son reminds me of something I just read this morning in Between the World and Me, by Ta-Nehisi Coates: “Black people love their children with a kind of obsession. You are all we have, and you come to us endangered. I think we would like to kill you ourselves before seeing you killed by the streets that America made.” I can't presume to know what Joshua was thinking, but I do feel like this quote really points out the fallacy in that microaggression. It kind of reminds me of the Babies Need Words Everyday campaign too... the original study that "30 Million Word Gap" was based on codified the way Black families spoke to their children as negative, and therefore blamed them for setting up their children's "achievement gap." Deirdre, I really appreciate your sensitivity and candor about this. It's not easy to suggest that someone put down their pen. I see the "that's not what I meant" explanation so often from White authors, and I can understand that. Unfortunately, they can't travel with each copy of the book so their words have to stand for themselves. Although it was published back in 1982, I highly recommend SHADOW AND SUBSTANCE: AFRO-AMERICAN EXPERIENCE IN CONTEMPORARY CHILDREN'S FICTION by Rudine Sims Bishop. She really gets to the heart of what is authentic -- and what is not -- in the portrayal of African-American characters. As a critic and a reader, I learned so much from reading her book that I can still apply to the new books I am reading. Thanks for the reference. I will definitely look it up. Thanks for a thoughtful review, Nina. Looking at this from a bookseller's point of view, my first impulse is to pass on this title because of the problematic content you mention. But we are a small indie bookstore carrying only new titles. 2/3 of the store is for adult books. So in our excellent but small biography for kids section there are maybe a half dozen Black subjects, mostly sports figures. I want more choices in that section. There are zero other biographies of poets. I want more poets too. I think micro aggressions are a serious problem. They should be avoided or minimized whenever possible. But as a bookseller I have a real problem telling guests that a book will be too painful for them to bear. By not stocking the title I don't give them the dignity of choosing for themselves what is valuable and what is offensive. It seems so patronizing. Who am I to say? If we were awash in Dunbar biographies, I'd ask the store buyer to pick a different title, but near as I can determine, this is the only Dunbar biography for kids currently in print. The long-term answer is obvious. We need more diverse titles of higher quality, but in the short term which is better an imperfect book or no book at all? Rosanne, thanks for asking the hard question, which is essentially the same as the one facing librarians. I would ask you to step back to the day this book wasn't published, and then ask...what does it add to the world, and do my customers need that? Or, since you are a bookstore: is this what I want to sell to in my customers? Who are you to say?...you are the bookseller. I think micro aggressions should always be avoided, not just minimized. And while I take your point about dignity of choosing for oneself... what about the dignity of your readers, reading this? Have you read it? You may want to, before you choose to stock it. I imagine your readers have the ability to get a book outside your store if they choose, or to request special orders through you. You say it seems so patronizing not to allow your readers to choose what is valuable and what is offensive. Isn't it patronizing to minimize the appropriation of a Black voice as is done here? If you want to stock every title about George Washington, crappy or not, that is fine because George Washington doesn't suffer in the white establishment. Yet you don't have to, because you can choose from plenty. The fact that you have no good selection of well-written Black biographies for children suggests to me that the message to send to publishers is "get it right." KT I've been thinking about this... As none of the sources I read from Derby's list of sources painted such a single-dimensional picture of Joshua. You are definitely on to it I think. Rather some contemporary "Grandma"... Derby attributes her voice to any number of church ladies she's known. Dunbar, of course, hung his success on controversial use of dialect that was not his own... But was from his own cultural history. Derby's eerie parallel is just ... Eerie. She doesn't remark on it. I just sit in awe and the thought, intelligence and deep questioning going on here. You are making me look much more closely at how I approach books and realizing how infrequently I ask enough questions of a text. That is a powerful statement from Ta-Nehisi Coates. Wow. And thank you for modeling one of the best ways White readers/critics can sharpen their skills -- by reading books by African-American authors, for children and adults, as well as books by authors of color and Native authors. And lots of them! When you can fill your head with the authentic voices, the spurious ones begin to stand out. Lisa, I am fascinated and troubled by what you say about the biases in the 30 million word gap story--and it definitely rings true. Can you point me to your source? I believe you, just wondering where I can learn more. GREAT question, and I agree with Nina's answer, and also want to emphasize the importance (as she said) of reading the book yourself--and being willing to have conversations with customers about it. As a former bookseller and current librarian, I've had a lot of those conversations, on everything from Tintin to Twilight. I find that I learn just as much as I teach when I engage in conversations about these topics. Want to hold up Monica Edinger for a second here as a good example (not a hero, just a role model) of what more White writers need to do: Rather than wipe the brow and say "phew, not me!" when a critical review comes out, treat it as a gift and use the opportunity to self-examine. Thanks, Monica. Referencing an earlier part of the conversation: I, too, sometimes struggle with dialect. I do 3-4 readalouds per day in my job, and I want them to be diverse as possible, and that includes linguistically. It's a judgment call. One of my "wake-up" moments was when I attempted FLOSSIE AND THE FOX by Patricia McKissack--one of my all-time favorite picture books. I realized midway through that much as I loved it, I could not, as a White person, do Flossie's dialogue without conjuring up mental images of minstrel shows and blackface. I will never attempt that as a readaloud again, even as I promote the heck out of it. There are certain things that we White folks simply need to NOT DO (boo hoo, poor us). I will say that when I wrote Jefferson's Sons I very consciously stayed away from using dialect, for several reasons. First, I hate reading bad dialect, and am not convinced I write it well. Second, to have the Black characters speak one way and the White characters speak another, when they were basically raised in the same household, struck me as probably historically inaccurate. The fact that Sally Hemmings was enslaved does not mean she spoke differently than Martha Jefferson, with whom she shared her adolescence. Third, I did see using dialect as a microaggression: given that I could not be sure it was historically correct, and, in fact, felt it was likely historically incorrect, then dialect would be a way to subtly demean the characters using it. Fourth, I felt that I would be sending a message to modern readers that I didn't want to send. Sharon, thank you. We can all do this kind of deep questioning if we create a community that welcomes it. We have to take responsibility for our positions as critics to actually be critical: fairly and without fear of hurting feelings. One more thing--readers told me both that they wished Jefferson's Sons had included dialect and that they were grateful it did not. Every Black person who commented on it was grateful I had not; only White people wished I'd used dialect. Thanks for getting back to me Nina and for chiming in Allie Jane. I do love the bookstore conversations. Someone came in recently looking for Babar (which we don't carry) but she remembered it with such fondness she wanted to order one for a grandchild. I encouraged her to read the whole thing through before she bought the title to see if it was the book she remembered and if it set well with what she knows about African history. She was really surprised by the racist undertone she now saw, and was thrilled to go home with DRAW by Raúl Colón instead. So that's the fun part of bookselling. So if we are in agreement that no book is better than a problematic book like the Dunbar biography then I have a follow up question about future acquisitions of black subject biographies and comp titles. I realize this is quite a tangent from the topic of this thread. Would you be willing to address that issue in a different post? Rosanne, I don't quite understand what the question is that you're asking us to address. Can you say it again?